The Pencils, They Like Him. Just finished this at about 4 in the morning (I tend to lose track of time when drawing), and sprayed lots of fixative on it a little while ago. BLACK graphite takes a lot of clearcoat to keep it on the paper. I am pleased with the outcome – this one more than makes up for the disproportionate mess that was my last attempt at Mr. Tennant. So if you want a closer look, just clicky on that little preview image over «there. [subject change] I purchased Muse’s new single from iTunes today. What is with this $1.29 crap? Anyway. The song is quite different from anything else they have ever recorded. I suppose it has a similar feel to Supermassive Black Hole, but this new song, Uprising, is even more synth-stompy, and brings to mind Marilyn Manson. I still think Matt is trying to make his singing sound different, and I still don’t quite appreciate that. He’s much better being natural. 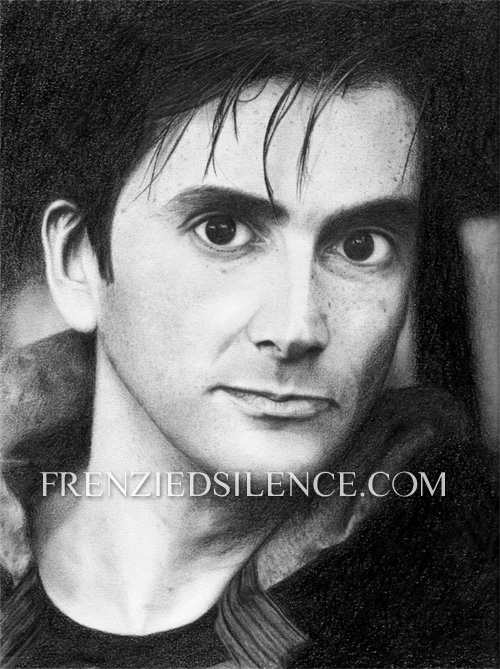 Wow, that drawing of David Tennant is amazing. ;o; You’ve got some serious talent. yes, I do most of my creative stuff in the wee hours.